The Marx Brothers have never been in a picture as wonderful as they are.” So observed film critic Cecilia Ager, and though she made the comment with regards to A Night in Casablanca (1946), it’s hard not to interpret that she was speaking about the revered comedy team’s cinematic oeuvre in general. We know, of course, that this is not entirely true; the brothers Marx made any number of great comedy films — Animal Crackers (1930), Monkey Business (1931), Horse Feathers (1932) — and at least two genuine masterpieces, Duck Soup (1933) and A Night at the Opera (1935). Ager was probably arguing that the freewheeling, spontaneously anarchic spirit of the Marx Brothers’ comedy (W.C. Fields once remarked that their vaudeville act was the only one he couldn’t follow) was difficult to contain on film but with the passage of time you can’t deny that they did what they could with the tools that they had. Depending on the day of the week you ask me, my favorite Marx Brothers vehicle fluctuates between Feathers, Soup and Opera, but because 75 years ago the latter film was first released to theaters, I’ve decided that for the time being A Night at the Opera is my choice for the team’s all-time best. Wealthy widow and opera patron Mrs. Claypool (Margaret Dumont) has employed Otis B. Driftwood (Groucho) to help her break into high society — but the scheming Driftwood seems more interested in taking her to the cleaners, bombarding her with insults and insincere flattery while collecting his fat salary. At a restaurant in Italy, Driftwood introduces Mrs. C to Herman Gottlieb (Sig Ruman), the manager of an opera company in New York, who hopes to sign tenor Rodolfo Lassparri (Walter Woolf King) to a contract — and Gottfried, pandering to Claypool’s interest in opera, invites both of them to a performance of Pagliacci to see Lassparri perform. At the opera house, Lassparri — a particularly nasty piece of work — abuses his dresser, the impish Tomasso (Harpo), by striking him with a whip…an act that does not endear him to his leading lady, the lovely Rosa Castaldi (Kitty Carlisle). Lassparri then pretends to apologize to Tomasso in an attempt to win Rosa’s admiration, but he’s SOL — she only has eyes for Ricardo Baroni (Allan Jones), a tenor with a far better voice than Lassparri but who’s only, in his words, “a glorified chorus man.” Baroni’s fellow music school chum, jack-of-all-trades Fiorello (Chico), has offered to become Ricardo’s manager and to try and make him as renowned as his rival — and successfully signs a contract with Driftwood on Ricardo’s behalf when Driftwood mistakenly thinks Fiorello represents Lassparri. Now a member of the New York opera company, Lassparri travels by steamship along with Rosa, Gottlieb, Mrs. Claypool and Driftwood — Rosa is saddened that she’s leaving Ricardo behind, but he’s managed to stow away along with Fiorello and Tomasso in Driftwood’s steamer trunk. Having arrived in the Big Apple, the stowaways are being sought by the police for being in the country illegally, and Driftwood loses his position with Mrs. Claypool for being involved with the three men. But when Rosa is fired because of her association with Ricardo, the quartet devise a scheme to wreak havoc during the evening performance of Il Trovatore…and having made a shambles of the presentation, our heroes triumph in having Lassparri ridiculed and establishing Ricardo and Rosa as the newest opera stars for a successful happy ending. 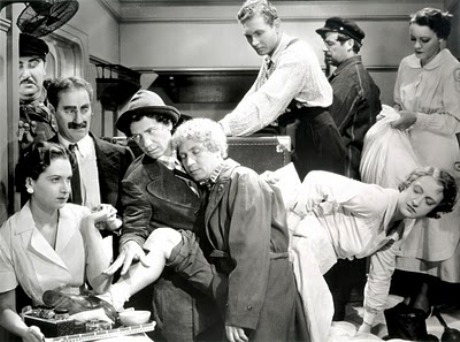 Though it’s considered a satirical masterpiece by fans and devotees today, in 1933 the Marx Brothers vehicle Duck Soup was a huge critical and financial flop…and the Marxes’ studio, Paramount, wasn’t much interested in making any more movies with the brothers after that — in fact, the fourth brother in the team, Zeppo, retired from future onscreen appearances, having grown weary of his role as straight man and love interest. (It has been said that Groucho himself considered packing it in also, leaving things up to Harpo and Chico as a duo.) Because Chico was on good terms with many of the motion picture studio heads due to his love of bridge, he was able to get MGM’s “boy wonder” Irving Thalberg interested in making a film with the remaining brothers in the act. Thalberg would never be mistaken for a comedy expert, but he theorized that what kept the Marxes from being successes at the box office was that their anarchic personalities — the fact that nothing was sacred to them and that no individual would be spared their relentless comedic wrath — appealed to a rather limited audience. A Marx Brothers film that had structure and a good story — particularly a love story, one that would attract female moviegoers — couldn’t miss, and MGM, “the Tiffany’s of movie studios,” was certainly up to the task. MGM has been criticized (I myself have been particularly vocal on the subject at Thrilling Days of Yesteryear) as a studio with no particular aptitude for comedy, and the films they made with Buster Keaton and Stan Laurel and Oliver Hardy would seem to bear that out. But in the case of the Marx Brothers and A Night at the Opera, the studio and the team compromised: Groucho and Company took care of the comedy, while Thalberg and his crew supervised the rest. In “taking care of the comedy,” Thalberg gave his stamp of approval to allow the brothers to “road-test” the material in Opera, which they did in front of live audiences in several major cities across the country. Large portions of the script — credited to George S. Kaufman and Morrie Ryskind (story by James Kevin McGuinness), but also containing contributions from Bert Kalmar, Harry Ruby, George Seaton, Robert Pirosh, Al Boasberg and Keaton — were stitched together for a revue that was gauged for maximum audience reaction. Jokes that didn’t work were tossed out; jokes that did were timed for their fullest laugh-getting potential. This sort of innovation could only have happened at MGM, and was repeated for the Brothers’ follow-up film, A Day at the Races (1937) — even though Thalberg passed away in 1936, the pre-production on that film allowed the Marxes to give that film’s comedy material a similar try-out. The other memorable sequence is what has become known as the “stateroom” sequence. On the steamship, Gottfried has arranged accommodations for Driftwood that you couldn’t swing a cat in…and with the arrival of three more unwelcome guests (Ricardo, Fiorello and Tomasso) Otis’ quarters become very close indeed. Driftwood tells his new roommates that they have to am-scray uster-bay because he’s expecting a visit from Mrs. Claypool, but the trio announces they’re staying put until they’ve been fed. After a hilarious routine in which Driftwood orders a meal the size of Rhode Island (“…and two hard-boiled eggs”) an endless string of people — waiters, cleaning ladies, two ship’s engineers, a manicurist and a girl looking for her “Aunt Minnie” (a nice in-joke reference to the brothers’ famous mom) — invade the room, packing its occupants in like proverbial sardines (a total of 15 in all). When Mrs. Claypool arrives for her rendezvous with Otis, she opens the stateroom door and everyone goes spilling out into the hall. A scene that was in the movie but now apparently has been lost occurred at the film’s opening (it is rumored, however, that a Los Angeles collector owns a complete print of Opera, including the excised scene). Opera originally kicked things off with a musical number set in Italy in which various individuals (a street sweeper, a sea captain, etc.) perform snatches of numbers from Pagliacci — much in the vein of the beginning of the Maurice Chevalier film Love Me Tonight (1932). The sequence ends in the restaurant, where Mrs. Claypool asks a waiter about Driftwood’s whereabouts — the way the film commences today. For years I thought the abrupt beginning of Opera was simply a device to get the comedy off-and-running, but according to film comedy historian Leonard Maltin (whose commentary is featured on Opera’s DVD) MGM trimmed all of the references to the Italian backgrounds during World War II (because the “Eye-Ties” were on the other side of the fighting)…and stupidly used the original negative for the deletions. This (and other bits cut here-and-there) explains why so many previous sources stated that Opera had a 95 minute running time (the film runs 92 minutes in its present form) and despite the rumored existence of the found footage, Warner Bros. has expressed little interest in seeking it out for a long-overdue restoration. While no one will dispute the classic comedy status of A Night at the Opera, the film tends to take a back seat to Duck Soup in the Marx Brothers pantheon by both fans and critics — my blogging colleague Mark Bourne of DVD Journal has remarked that “something got lost in all that MGMness when the screen’s ultimate anti-authoritarian team starting working the Andy Hardy side of the street.” Film critic Roger Ebert concurs, adding that he “fast-forward[s] over the sappy interludes involving Kitty Carlisle and Allan Jones.” But I tend to side with Maltin, who has long championed the opinion that both the musical and romantic sidebars in Opera strengthen the film as opposed to weakening it. Carlisle and Jones are both very appealing as the love interests, and the music (which includes the hit song “Alone”) is far-and-away better than that in the team’s later MGM vehicles (The Big Store , I’m talking to you! ); it’s definitely superior to much of that spotlighted in their Paramount features (Marxists sometimes forget that those films, notably The Cocoanuts  and Animal Crackers, also feature tuneful interludes that bring the comedy to a screeching halt)…with the exception of “Hooray for Captain Spaulding,” natch. In Opera, I never fail to be impressed that portions of actual operas (Pagliacci and Il Trovatore) are being sung even as Groucho, Chico and Harpo mercilessly lampoon them. While I like A Night at the Opera a great deal, I always prefer the anarchy of their Paramount works to their MGM ones. Duck Soup is my favorite, with Horse Feathers close behind. I may be getting them all confused, but didn't they use the Sanity Clause joke in one of the earlier films also? I realize I'm arriving at this party six years late but I had to refute the accepted wisdom that DUCK SOUP was a bomb. In fact it was the 6th highest grossing movie of 1933. Paramount did not drop the boys, they simply couldn't agree on terms for a new contract so the Brothers wound up at MGM where Thalberg began the systematic attempt to domesticate them which eventually gave us THE BIG STORE. Ugh.